Spaghetti squash goes great with tomatoes and leftover squash gets a new life as a hearty base for this yummy veggie-centric breakfast or brinner – breakfast for dinner (see recipe below). OK so this is not a take it to school lunch but can work for brunch so that’s close to lunch and hey I feel obliged to share some ideas to get our veggies in early in the day so we’re not left eating 4-5 cups of veggies for dinner! Watch Spaghetti Squash 4 Ways for a quick idea of how to make this plus 3 more terrific ways to eat spaghetti squash. Dietitian's Tip: It’s easy to work vegetables into your breakfast meal when you combine them with eggs. This meal can work for breakfast, brunch, lunch or dinner. *Kids Cook: I find teaching kids how to cook breakfast is a great introduction to cooking. In large rimmed baking dish spread out 3 cups of Spaghetti Squash with Herb Butter and Parmesan set aside. Slice top third off of 6 large tomatoes. Use a spoon to remove core and seeds from tomatoes. Arrange tomatoes onto the spaghetti squash. Drizzle tomatoes with 2 tbsp canola oil, ½ tsp EACH coarse salt and pepper. Roast in 400°F oven until tomatoes are softened, about 15 minutes. 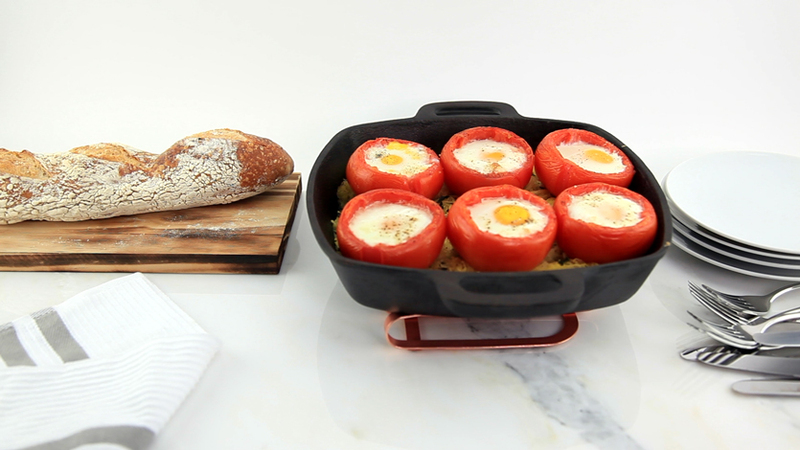 Crack an egg into each tomato and season eggs with salt and pepper. Return to oven and bake for about 15 minutes or until egg whites are set and yolk is a bit runny. Short on time? Try this instead. • Serve a poached egg over the Spaghetti Squash with Herb Butter and Parmesan . Need breakfast for one or two? Try making this in the toaster oven. Once the egg white is firm it’s ready.